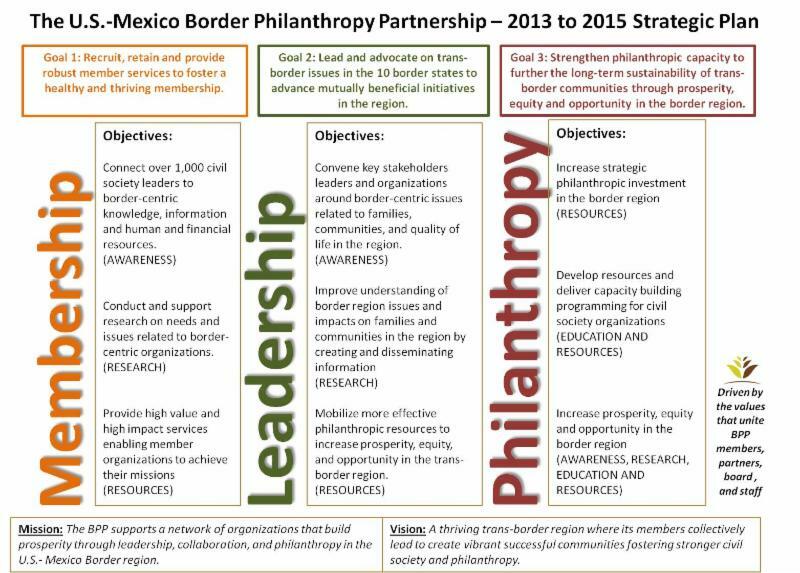 Mission Statement: The U.S.-Mexico Border Philanthropy Partnership (BPP) is a binational membership organization whose mission is to support a network of organizations that build prosperity through leadership, collaboration and philanthropy in the Border region. We strengthen organizations already working actively to address issues of prosperity, equity and opportunity along both sides of the Border. Advancing Health and Wellness: Many daunting challenges face us at every turn. The issues are well known but persistent: if the area comprising the border region were America’s 51st state, it would rank at or near the bottom in nearly all measures of prosperity, community health, educational opportunity and quality of life. It is more than tragic, it is wasteful, because these challenges do yield to informed and vigorous action. BPP members and partners believe that the nature of these issues demands strong and informed civic participation, leadership and cross-border understanding and collaboration. Specifically, we seek to build and strengthen community philanthropy by supporting and advocating for systemic solutions to systemic challenges in the areas of education, health, environment, poverty, security and financial literacy. So BPP draws together our academic and research partners to inform change, our philanthropic and corporate partners to fund change and our nonprofit partners to implement change. Description: The U.S.-Mexico Border Philanthropy Partnership (BPP) is a binational membership organization whose mission is to support a network of organizations that build prosperity through leadership, collaboration, and philanthropy in the U.S.-Mexico Border region. Our member-driven agenda strengthens organizations already working actively to address issues of prosperity, equity and opportunity along both sides of the Border. We provide high-impact services including research, coaching and access to practical and timely tools for organization building. We bring members together with the full range of stakeholders working to improve the Border Region’s quality of life for communities and families. We provide unique cross-cultural competency services to facilitate and enhance more effective communications and understanding among civil society leaders and organizations. We help members build their ability to grow funding sources, increase strategic investment and amplify the effectiveness of their activities. We offer targeted trainings on innovation and evaluation for organizations helping low-income families and communities get out of poverty and reach financial stability. We draw together our academic and research partners to inform change, our philanthropic and corporate partners to fund change and our nonprofit partners to implement change. Our growing and dynamic network includes leaders and organizations from academia, business and corporate entities, government, philanthropy and nonprofit organizations from across the 10 Border State region, as well as distinct areas around U.S. and Mexico. We share a common vision and commitment for a thriving border region. The complete list of current members is available here. BPP engages an active Family Asset Building program with key partners along the entire 2,000 mile border region from San Diego to Brownsville. BPP aims to increase prosperity, equity and opportunity in the border region by offering targeted Family Asset Building (FAB) trainings on innovation and evaluation for organizations working to help low-income families and communities get out of poverty and reach financial stability. We achieve this by providing targeted trainings on innovation and evaluation for organizations delivering asset building programs in border communities.